Many truck wrecks are the result of truck maintenance problems, with brake failures and defects in tires being two of the primary causes. Not maintaining truck tires can result in a tire blowout, which can strew long, heavy strips of rubber from the tire across roads and highways. Unfortunately when a tire blowout occurs, victims in passenger vehicles can suffer catastrophic injuries or deaths. What Are the Main Causes of Truck Tire Blowouts? A truck tire blowout is more serious than a flat tire. It is the sudden bursting or ripping apart of the truck tire—often occurring when the truck is being driven at higher speeds. Because they occur suddenly, a trucker can lose control of his truck and smash into nearby vehicles, which can quickly turn into a multi-vehicle crash. In addition, other drivers trying to swerve out of the way of the truck, other damaged vehicles, and rubber tire debris can add to the pile-up, making the wreck even more deadly. Lack of inspection. Under Federal Motor Carrier Safety Administration (FMCSA) regulations, truckers are required to conduct pre-trip and post-trip inspections of their trucks for maintenance problems. They are prohibited from driving a truck if it is in a condition that makes it likely to cause an accident or breakdown. In addition, FMCSA rules require trucking companies to inspect their trucks and their components—including the tires—on a regular basis. When truckers and trucking companies fail to conduct these inspections or ignore problems they find with the tires, a tire blowout is the likely result. Lack of maintenance. Besides inspecting trucks and tires, truck drivers and trucking companies are required to maintain and repair or replace truck parts when necessary under FMCSA rules. When there is a problem with the truck’s components, an out-of-service sticker is supposed to be placed on the truck, which should not be removed until the problem is repaired. Truck blowouts often occur when the tires are not maintained, repaired, and replaced, and the truck is allowed on the road when it is likely to cause an accident or breakdown. The trucks are equipped with tires that do not meet the Department of Transportation’s requirements for tread depth. The truck tires were manufactured defectively and may be subject to a recall. Mismatched tires that are not the same size or that have significantly different wear are mounted on the truck. The truck’s spare tire is defective or worn. The tire is over- or under-inflated. The tire or its treads are worn and old and in need of replacement. The truck load was over weight. The truck driver used his brake pads excessively. The truck tires were utilized for an excessive number of miles. There were defects in the road, such as potholes or uneven pavement. The trucker did not drive safely in weather conditions, such as ice, rain, and snow. What Other Parties Could Be Responsible for Compensating You in a Truck Tire Blowout Wreck? Company who loaded the truck. If the company who loaded the truck overloaded it or failed to secure the load properly, their negligence may have contributed to the truck tire blowout. Tire manufacturer. If the tires were defective, the tire manufacturer could be responsible for compensating you. Common defects in truck tires include problems with the tire treads or the belt adhesion separating. Truck maintenance facility. 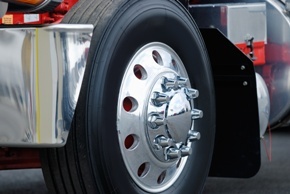 Some trucking companies hire third parties to install, repair, and replace their tires. If the work they performed on the tires—or failed to perform—contributed to your crash, you may be able to hold this company responsible for your injuries. An experienced truck accident attorney can determine who the liable parties are if a truck tire blowout caused you or a family member to suffer injuries in a truck wreck. Contact us online or call us diectly at 888.795.6261 to schedule your free, no-obligation consultation. Learn how we can help you obtain the compensation you may deserve.